Cicada and the doctor talk. She got him groceries. He asks about Grace. She’s stable, but heavily guarded by CCPD. She wants him to redirect his anger and hands him a folder. She has a metahuman hating friend in the police department. He attacks Novok and a friend. Novok gets away, but the friend doesn’t. Barry and Nora are at the scene. While they’re looking it over, they get notified that another person has been killed. Ralph walks in on Caitlin and Killer Frost arguing about the cure. Killer Frost is destroying all of Caitlin’s work. Caitlin also needs the blood of a recent metahuman, but all the ones that she can think of have been killed by Cicada. Sherloque is still trying to translate Nora’s journal. Iris comes over the intercom and tells him that he’s needed in the cortex. Another meta has been killed. That makes three in the last 12 hours. It’s about to be four. Cicada is fighting a woman. He stabs her, but she manages to limp away. When Team Flash shows up, Ralph shoots him and Killer Frost blasts him. He breaks through as Caitlin tries to help the woman. He then goes full Zoom on Nora. She’s alive, but she’s paralyzed for the moment. And the moment might be longer than they anticipate. Cicada flooded her with dark matter and it’s interfering with her speed healing. She wakes up. She freaks out and yells for Iris over and over. Iris and Barry tell her that she’ll be alright, eventually. Cecile shows up. She called Joe. Sherloque finds a connection between all of the recent victims. They were all ex-criminals. They find the document that the doctor gave Cicada. It doubles as an arrest log and a hit list. Singh makes a speech about wanting to get Cicada, and then Barry and Cecile show up. They show him the list, but he has a hard time believing that someone from the police department was involved. Cecile get Barry out before he completely explodes and tells him that she has a plan. She wants to get the feds involved and put them all in Witness Protection. In the meantime, he needs to get them all somewhere safe. Nora is making slow progress. Her and Iris talk for a bit, but Nora mostly just wants to be alone. Ralph sees Killer Frost destroy Caitlin’s cure board. Barry comes in and asks for her help in finding the metas. They find Norvok and give him the list. He agrees to help only if he’s the first one out. Cecile talks to Singh. She needs roadblocks to get the transport out. He agrees. After they finish talking, she comes across Officer Jones from “News Flash” and feels some disturbing vibes. Most of the metas are gathered at Amunet’s. Some of them want to fight, but Norvok convinces them to stay. Killer Frost talks to him. He used to work at the zoo before he got his powers. He saved a kid from a snake right before he got hit by dark matter. That was the last time he put somebody else first. He leaves and Ralph talks to Killer Frost about the cure. Cecile is worried about Barry. He has the same rage coming off of him as Cicada, and Officer Jones. She’s going to take care of that. Nora can finally wiggle her toes. Sherloque comes and ruins the moment by asking her several questions. Iris, who has been listening in, brings him out into the hallway and tells him what for. Killer Frost and Ralph finally get to the obvious. She’s afraid of disappearing if Caitlin takes the cure. 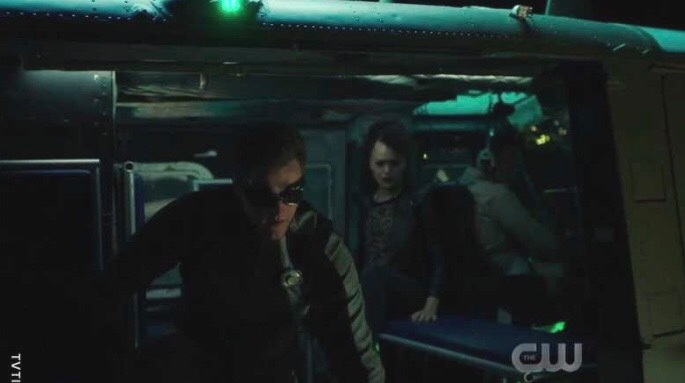 The less obvious part is that she’s afraid because no one will be left to protect Caitlin. Ralph tells her that Caitlin wants to protect her too. Cicada talks to Officer Jones. Jones tells him about Cecile and her plan. A helicopter comes to take the metas to safety, but Cicada attacks it and blasts all the metas. Barry tells Ralph to get everybody out. He wants to take on Cicada himself. Peek-a-Boo gets on the helicopter all by herself, but nobody else can? I don’t precisely understand what Cicada did to this helicopter. Anyway, Ralph comes up with a plan to get them all on. He uses his arms to grab them and pull them up, one at a time. Killer Frost helps Barry with Cicada. She makes an ice dagger and stabs him. Cicada blasts again and knocks them both to the ground. Killer Frost almost gets stabbed with the dagger, but Caitlin tells her to duck. Ralph saves Novok right before he gets stabbed. While Killer Frost blasts the dagger, Barry wales on Cicada. He’s harnessing far more energy than normal and he isn’t stopping. Seeing that he has no intention to stop, Nora goes and tells him to stop. Killer Frost gets tired and lets the dagger go. Cicada flies away. They get confirmation at S.T.A.R. Labs that all the metas are safe and that Cecile is taking care of their other problem. Jones gets called to Singh’s office, where Singh and Cecile confront him. He tries to run, but Cecile senses it and the other cops get him. Killer Frost got Caitlin a new board. She also got some of Cicada’s blood, which is exactly what Caitlin needs. Sherloque discovers that there are two distinct handwritings in Nora’s journal. The Westallens talk, hug, and eat tacos. Barry has an idea on how to reach Cicada. They have to help Grace. Cicada is menacingly looking at pictures of Nora. Why Nora? Killer Frost is the one he should be worried about! As I said before, I hate the cure storyline, but the rest was good. You don’t mess with Barry’s little girl! 8/10.